As many know, I collect fandom artwork. I have an entire fandom room in my house where the walls are filled with pieces from many different artists. When I find an artist who grabs my attention, I follow them and take an interest. I have been drawn to the art of Petite-Madame for some time because every new piece takes my breath away. The hyper-realism of her work coupled with the amount of details she includes is unmatched by other artists I’ve come across. An important part of artwork to me is the ability to discover new and interesting details on the second, third, fourth time you look at the piece. 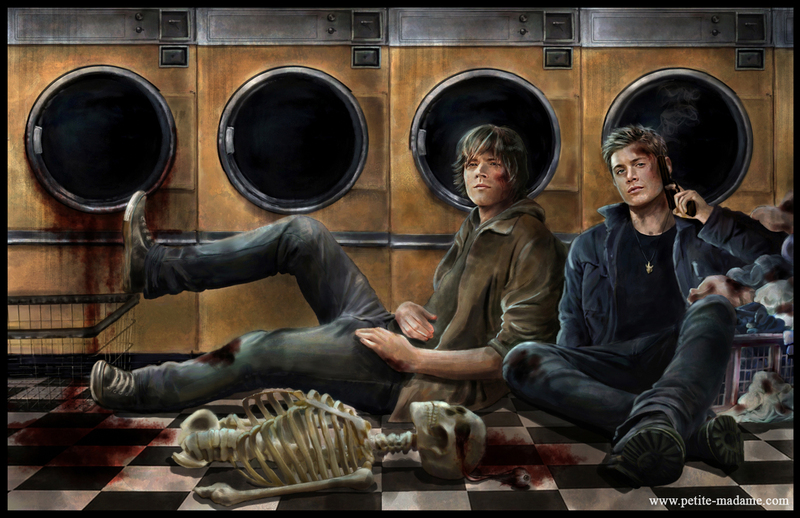 The first time you look at the piece entitled Winchesters’ Laundry Day, you may simply take in the facial detailing of the Winchesters, but then other contributions catch your eye, such as Dean’s still-smoking gun, the visual remains of the unlucky skeleton, and the blood trail that makes you wonder just what went down in that laundromat anyway. Check out Petite-Madame’s post as she discusses how the piece came together. Also of appeal is when character details become important in artwork. Petite-Madame’s piece above is titled Eat It Twilight, which is amusing in and of itself. 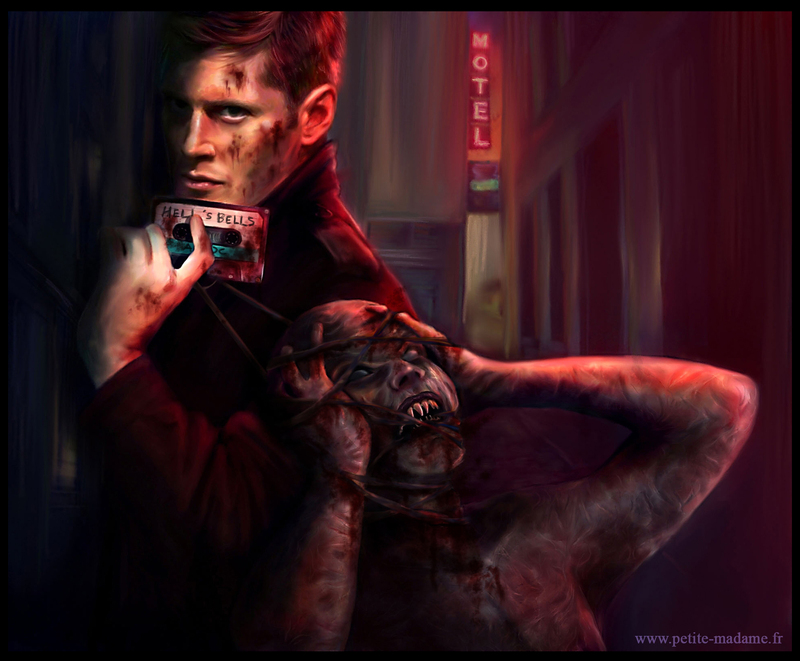 More amusing, and fitting, is that Dean Winchester would of course kill a vampire with a cassette tape of AC/DC’s “Hell’s Bells.” The man refuses to leave behind his cassette collection, so he might as well use them in his arsenal of weapons. 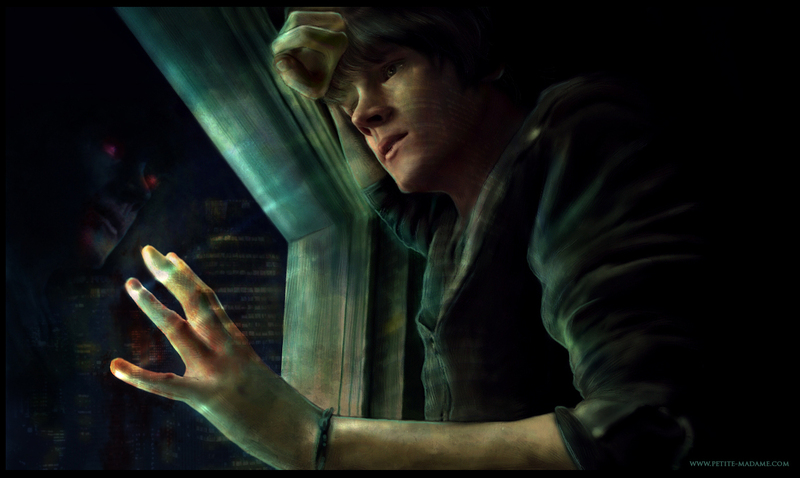 You can read more about how this piece evolved in the artist’s post. Be sure to look at all the color and black & white Supernatural illustrations available from Petite-Madame. It’s always a pleasure to see an artist of this high quality sharing her gift with the fandom at large. Thanks a lot for such a feature! I am flattered! Your art is magnificent and it’s always a joy to see your new works. I look forward to seeing what you come up with next!